Heraflux is proud to announce a new ebook as part of our joint partnership with Pure Storage! This ebook, entitled Overcoming SQL Server Storage Challenges, discusses the current state of infrastructure technologies and how it interacts and impacts the performance of Microsoft’s flagship database engine SQL Server. Arguably, storage has historically been the slowest part of the infrastructure stack underneath the database, so much so that the core database engine makes some assumptions that it will always be the case. Modern CPUs, memory, and even the network are much less a bottleneck than administrators commonly realize. Even modern SQL Server in-memory features, such as in-memory OLTP and columnstore indexes, are heavily dependent on the performance of the storage underneath them. 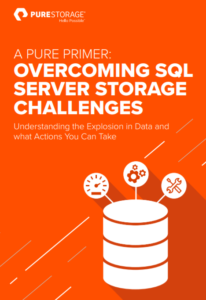 Learn more about how SQL Server and the enterprise storage your data rests on complement and contradict each other in this exciting new ebook authored for Pure Storage! Download this exciting PDF today!